Manfred Albrecht Freiherr von Richthofen, also known as the Red Baron, was a feared and celebrated German fighter pilot during WWI. He was considered an ace-of-aces in the war and has been officially credited with 80 air combat kills. Over the years, there has been a mystery surrounding his death. 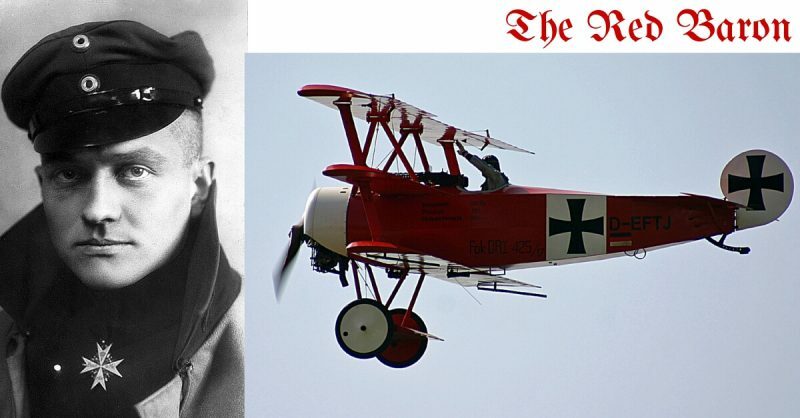 Who actually took the fatal shot that killed the Red Baron? After nearly a hundred years, an eye-witness account that sheds light on Richthofen’s final moments is now on sale at Bonhams in New York. On April 21, 1918, Richthofen’s famous red Fokker plane was chasing a British Sopwith Camel at very low altitude near Amiens, France. As the planes came in close to the Allied camp, another Camel, with two Lewis light-machine guns and another machine gun, joined in the chase. The two Camels fired simultaneously on the Red Baron’s plane. According to the newly emerged account written by Lieutenant Donald Fraser, as soon as the machine gun operated by Sergeant Cedric Popkin fired on him, the Red Baron’s flight became “wobbly and irregular.” Richthofen’s plane crashed and he was found dead with a bullet wound in his chest. Many contradictory accounts have emerged over the years regarding who had shot Richthofen. The RAF had officially credited Canadian pilot Captain Roy Brown, who had flown the second Camel plane. A Discovery Channel documentary claimed it was Lewis gunner Willy Evans, whereas a different documentary by Channel 4 credited Sergeant Popkin. There are several other items on sale along with this document, including photographs taken by Fraser of the wreckage of the downed plane. The estimated worth of the eye-witness account and the photographs is £5,000, the Mail Online reports. A 34×22-inch section of skin from another plane flown by the Red Baron and featuring a black Balken Cross is also on sale, with the estimated worth of £80,000! The auction was held at Bonhams, New York, on Wednesday, October 21.